Google Stadia: Netflix of Gaming? Google have announced an unveiled a brand new gaming platform. Which is very different to what Sony, Microsoft and Nintendo are offering right now. It’s called Stadia and the games will be streamed to you via an internet browser. Which are said to be better than console quality! Stadia is said to work on existing desktops, laptops, tv’s and phones, said Phil Harrison VP and general manager of Google. Even the least powerful of PC’s can run Stadia! 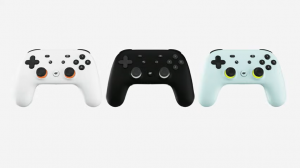 The tech giant also revealed a controller for Stadia. It looks much like a regular console controller. Though it also has a Google Assistant button and a capture button to capture gaming and directly put it on YouTube. ID Software announced that Doom Eternal will be one of the first games on launch. Which will be in 2019 in the US, Canada, UK and Europe. Exactly when that is in 2019 is unknown. No pricing was announced either. How can even smartphones, TV’s and not so powerful PC’s play these top end games? Well, because the games run elsewhere on Google’s own high end hardware. You connect to it via the internet, the hardware then does all the hard work and sends you a video feed of what you are playing back to you. Essentially. However, other services such as ‘OnLive’ which tried this back in the day (2010-2015) and Nvidia’s GeForce Now where some have encountered lag. They suffered due to the difficulty of offering high end games via an internet connection. But the question remains is it their end or is it the consumers own internet? Lag: A delay between an action being performed on a controller or keyboard and the action being replicated on screen. Google have said that the controller will connect to the internet directly. Which will then communicate with their servers which will reduce the amount of lag that players may encounter. Impressively (if they pull this off) Google will be able to offer games at 4K at 60FPS and up to 8K 120FPS in the future. (Who needs 8K?!?) The Stadia is also insanely powerful with a GPU of 10.7 GPU teraflops while Xbox One X the worlds most powerful console has 6 GPU teraflops and the PS4 pro has 4.2 GPU teraflops. Basically, it’s very very good. Google Stadia: We have some questions. Or we have to buy our own games? Can we download our games to play them offline? Is there protection from hacking? Will the footage be flagged for copyright from Stadia’s own capture system from YouTube’s Copyright flagging software? But most of all, how laggy will it be? People’s internet will need to be able to cope with the game, if there’s the slightest bit of lag it will put gamers off. Coupled with multiplayer games, if there’s double the lag, people will not want to use the service. It’s an interesting time to be a gamer certainly as Microsoft have their cloud service in the works too with ‘Xcloud’ so is this the way gaming is heading or will it supplement good ol’ physical disks or downloads. http://wp.freedomofcreation.co.uk/howtokillanhour/wp-content/uploads/sites/65/2019/03/Google-Stadia-Illustration-Screenshots.jpg 900 1600 billywright http://wp.freedomofcreation.co.uk/howtokillanhour/wp-content/uploads/sites/65/2017/09/htkah-web-logo-2017.png billywright2019-03-21 00:00:052019-03-20 18:45:07Google Stadia: Netflix of Gaming?